Sarah Townsend joined the practice in January 2017 after qualifying from University of Liverpool in 2015 with a combined diploma in Dental Hygiene and Dental Therapy. Sarah graduated with an award for the highest clinical ability over the three years of study. 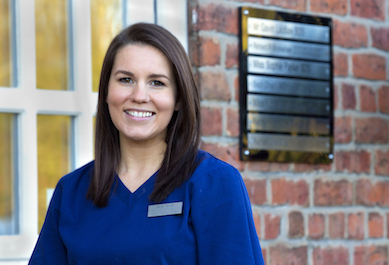 Since graduating Sarah developed her experience further working at different dental practices in Cheshire. Sarah has an interest in preventive dental care; she likes to work in a calm and relaxed manner particularly with dentally anxious patients, helping them to overcome their phobias. Since qualifying Sarah has taken a special interest in Periodontitis (gum treatment), implant care and maintenance and enjoys treating more advanced cases. Sarah prides herself in keeping her knowledge and skills up to date and provides a high standard of care in a friendly way. Sarah attends conferences and courses regularly to learn the latest techniques such as using airflow cleaning systems and whitening treatment. When not in work Sarah enjoys taking her Cockapoo Pippa for walks in her home town of Chester. She also goes to the gym regularly and takes part in charity events such a Liverpool Half Marathon and Tough Mudder Obstacle courses. To relax Sarah is a keen reader, enjoys socialising with friends and eating out in different restaurants. Sarah enjoys listening to music and going to live concerts.